Tornadoes are among the most devastating and awesome local storms that occur on Earth. The United States has the dubious distinction of having the greatest frequency and the most severe tornadoes. Tornadoes have the power to lift railroad cars and sail them many yards through the air. The power of their winds can make deadly missiles of loose objects, including broken glass. Even pieces of straw have been found embedded in trees and boards after a tornado. During the winter months (December through February) tornado activity is concentrated in the southeast U.S. and along the Gulf Coast. As spring (March/May) progresses, tornado occurrence moves north and west across the central Mississippi and Ohio River Valleys. By summer (June/August) the potential threat of tornadoes has spread across the continental United States and Southern Canada. During autumn (September/November), tornadic activity gradually retreats to the south and southeast sections of the country and is often associated with hurricanes. This seasonal drift is principally caused by the increase of warm, Gulf moisture into the central part of the country during spring and summer, decreasing during the fall and winter. The mixing which occurs when the moist Gulf air clashes with contrasting colder, drier air from the north and northwest contributes to the triggering of tornadoes. Minnesota lies along the north edge of the region of maximum tornado occurrence in the United States. Tornado Alley, as that part of the central U.S. has come to be known. In Minnesota, tornadoes have occurred in every month from March through November. 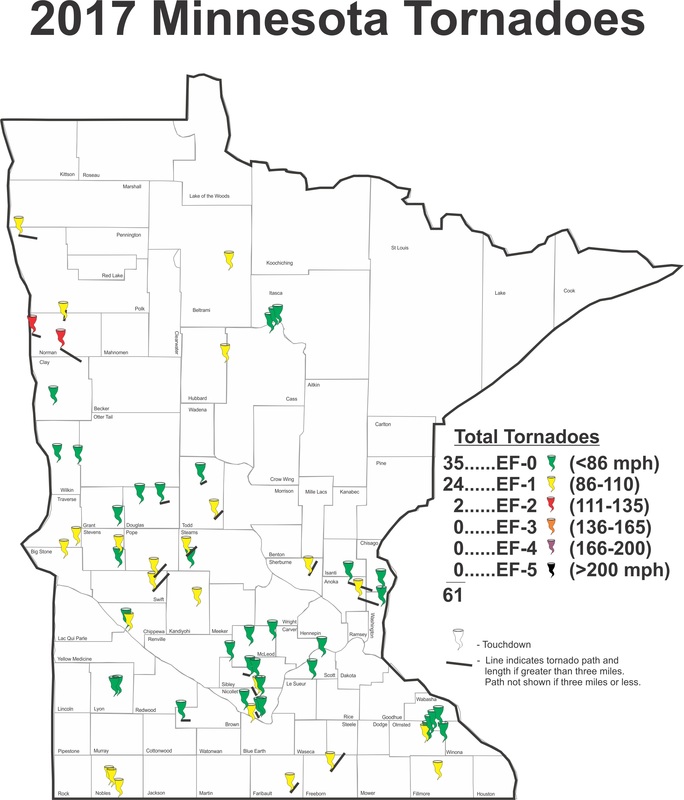 The earliest reported tornadoes in Minnesota were the three tornadoes that touched down on March 6, 2017.The previously earliest verified tornado in Minnesota occurred on March 18, 1968, north of Truman in Martin County. The latest in any year on November 16, 1931, east of Maple Plain. Historically and statistically, June is the month of greatest frequency with July not far behind. May has the third greatest frequency, followed closely by August. Nearly three-quarters of all tornadoes in Minnesota have occurred during the three months of May (15%), June (37%), and July (25%). The most probable danger period in Minnesota, therefore, is late spring and early summer, between 2:00 PM and 9:00 PM. However, tornadoes can and do occur at any time of the day or night. Most of the deadly and damaging tornadoes occur in groups of outbreaks that often last from 6 to 12 hours. One of the worst such outbreak in Minnesota occurred on June 28, 1979, when 16 tornadoes slashed across the state, from northwest to southeast, in a six and one half hour period. Two additional tornadoes occurred in eastern North Dakota with this system. Many such outbreaks have occurred, including the April 30, 1967 cluster in south central and southeast Minnesota. 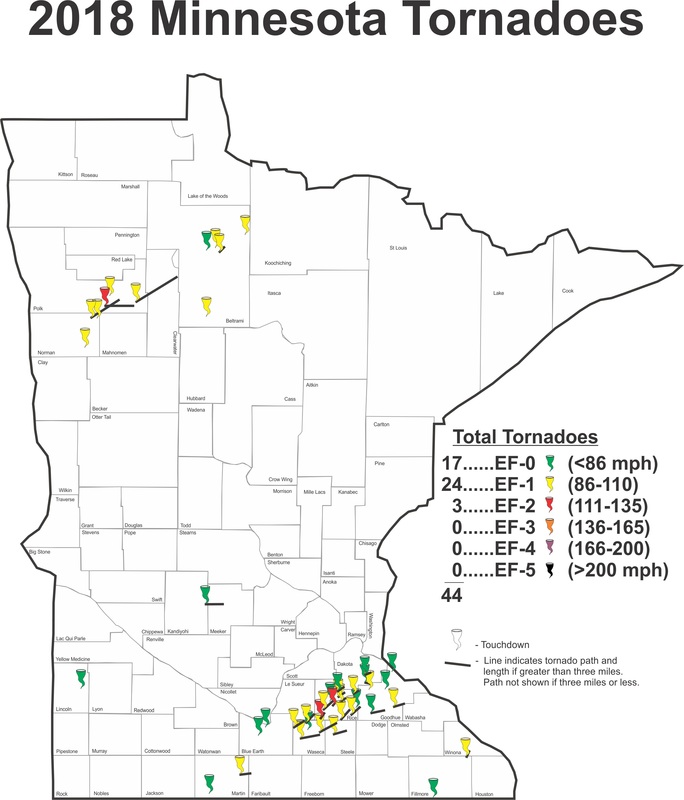 The largest tornado outbreak in one day in Minnesota is 48 tornadoes on June 17, 2010. The old record was 27 on June 16, 1992 that included an F5 tornado at Chandler.